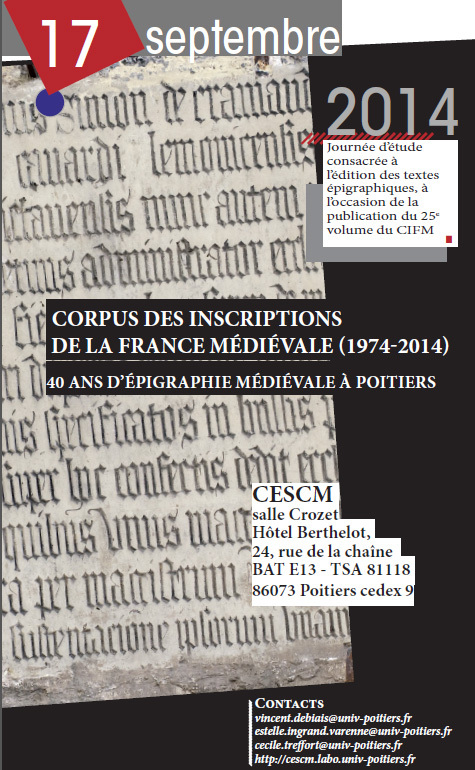 CORPUS OF INSCRIPTIONS OF MEDIEVAL FRANCE (1974‐2014). 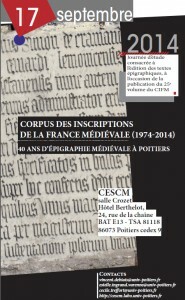 In the presence of the Poitiers-based participants in the edition of inscriptions, and of French and foreign researchers who have been associated to the work on the CIFM, be it for several years or just for the occasion, this anniversary will be an opportunity to come back on the forty years of research in medieval epigraphy, and the publication of 25 volumes. The communications will offer a review of the changes which helped bring the publication of medieval epigraphic texts to life (in relation to the general evolution of the subject on the one hand, ecdotics on the other hand), and at the same time an opening towards new horizons: technological (with the electronic edition of texts and the recognition of incised characters), cultural (Ancient or Byzantine epigraphy), or professional (scientific editions, museography). The international aspect of this event will allow us to share our different experiences and perhaps to identify what is unique to France, in the aim of improving publication techniques, at a time when the Corpus of Inscriptions of Medieval France is faced with new editorial challenges (vernacular languages, inscriptions in lower-case letters, paintings on an easel or on tables…). 11:45 Carlo Tedeschi (University of Chieti) and Elisa Pallottini (post‐doctoral student from University La Sapienza Rome): Medieval inscriptions of Italy. Results, problems, prospects.